38th version of Bangladesh Civil Service Exam Date are published by BD Pratidin, Ettefaq and there official website. 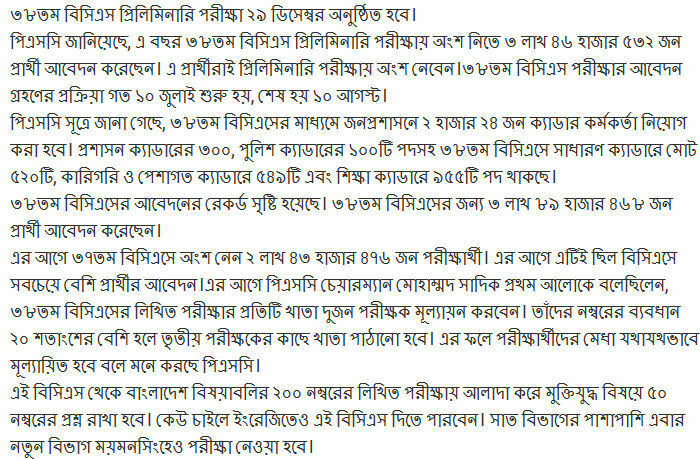 38th BCS Preliminary Exam Date www.bpsc.gov.bd published. Exam Will be start on 29 December 2017. 38th BCS examination Seat plan and written Exam Result of 2017 updated by bdeducationinfo.com . This exam held on End of the December 2017. After long time 38th BCS Final date published by BPSC authority . Now Read something about 38th BCS circular or Date Information below.. The PSC will publish 2,244 cadre officers in this BCS.According to PSC sources, 300 cadres of Administration cadre, 100 cadres of police cadres, 38 cadres in general cadres, 520 in general cadre, 549 in technical and professional cadre and 955 in education cadre posts. Thanks for visiting our website. For Next Updates about 38th BCS exam stay visiting our website. This entry was posted in Education Services, National University Result, Notice by admin. Bookmark the permalink.